July | 2018 | What Does This Button Do? 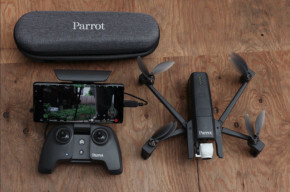 Just published: my review of the Parrot Anafi drone, the latest in the craze of folding portable video drones. The Parrot Anafi has a lot to like. It’s one of the most compact full-featured drones we’ve ever tested, packing into a small, water-bottle-sized package that fits easily into a backpack. And when you reach the destination, it’s easy to take out and fly the drone. The Anafi has a good selection of flight modes to take interesting shots, and the video it captures is pretty good, delivering clean, smooth video with plenty of detail. But there are a couple of caveats. It’s a small drone, which means it is easily buffeted by wind, and the lack of object avoidance requires more careful piloting. These factors mean we wouldn’t pick the Anafi over the Mavic Air, but it is worth considering if you are looking for a light drone that takes excellent video.